When used properly, essential oils are a wonderful tool for health and well-being. After much research, I now offer seven essential oil blends at SubEarthan Cottage in convenient roll-on form. Each blend is able to be customized for dilution, which is very important if you intend to use them on children or sensitive individuals. You can also choose between coconut, sweet almond and olive oils for the carrier. If none of my blends work for your needs, there is the option to choose a single essential oil or your own custom blend. I personally carry two blends with me at all times. They are “Peace” and “Balance”. Peace is a blend of Frankincense, Lavender, Orange and Patchouli essential oils. I love it for days when things get a bit crazy. It’s like a mini-vacation in a bottle. Balance is a blend of pure Clary Sage, Lavender, Frankincense and Myrrh essential oils. Those oils are thought to help with pms, mood swings and all the other fun that comes with monthly hormone shifts. Since the oils in Balance may effect hormones, this blend is not suitable for pregnant women. Relax is a blend of pure Lavender, Frankincense and Orange essential oils. It’s great for helping you unwind after a busy day. Focus is a blend of pure peppermint and orange essential oils. The bright, crisp scents may help keep you alert and focused. Release is a blend of pure lavender, peppermint and frankincense essential oils. I like rolling it on tense muscles. Soothe is a blend of pure eucalyptus, frankincense and lemon essential oils. It’s basically a nicer, less goopy version of the chest rub your mom made you use when you were sick. Eucalyptus is one of the essential oils that should not be used on children, so if you are interested in a version for children, let me know and I can swap the eucalyptus for something kid-friendly. Spring is a blend of pure lavender, peppermint and lemon essential oils. If you’re like me, spring and fall are torture due to all the pollen in the air. These oils are supposed to help ease seasonal allergy symptoms. I personally haven’t put it to the test yet, but I’m sure by October I’ll be able to give a full review. I go into more usage safety in the product listings, so be sure to read and ask questions if needed. I am always happy to make adjustments to the blends to better fit your needs. 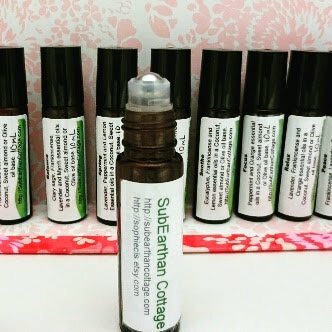 Right now, everything at SubEarthan Cottage is on sale for 30% off, including the essential oil rollers, so now is a great time to try them for yourself.